For the week of February 16, 2015, the MLS currently shows a total of 50 homes on the market in Mammoth Lakes only, ranging in price between $329,000 in the Sierra Valley Sites I subdivision up to $6,500,000 for a luxury home in the Bluffs. Over the past seven days, there were a total of three closed sales for single family homes in Mammoth: 688 Majestic Pines in the Mammoth Vista III subdivision sold for $915,000 @ $379.50 per square foot (PSF), 557 Majestic Pines, also in the Mammoth Vista III, subdivision sold for $1,425,000 @ $373.92 PSF, and 285 Juniper Road in the Juniper Ridge subdivision, which sold for $2,875,000 @ $663.21 PSF. Juniper Ridge is Mammoth’s only true “ski-in, ski-out” luxury residential neighborhood, which also offers 180-degree spectacular mountain views. 1428 Majestic Pines: This 3 & loft, 2-bath with a 2-car garage is listed for $665,000/$353 per square foot. This cute log home has a convenient location with shuttle bus access to town and the ski area only steps from the property and has been nicely remodeled (kitchen and baths). 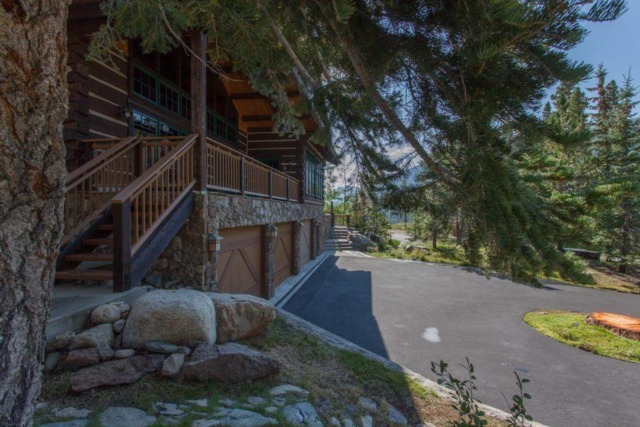 It offers a true “mountain resort” feeling and is situated in the pines on a 7,405 SF lot. Very close to Camp High Sierra and the Eagle Express (chair 15) area, this cabin is located in the Majestic Pines III subdivision. Now with 137 days on market, the sellers might be reaching a higher level of motivation and this property could be a great buy for the buyer who is looking for the log cabin experience with a convenient location. 536 Lakeview Blvd. : This 4-bedroom, 3.5-bath with attached 2-car garage and a professionally landscaped and fenced yard is listed for $979,000/$394 per square foot. This newer home was built in 2001 and is located just down the street from Canyon ski lodge (directly across the street from Mountainback condos). Offering 2,481 SF of living space and situated on a 7,405 SF lot, this home has many appealing features, such as gourmet kitchen, tons of sunshine with south-facing exposure, large deck, wired for surround sound inside and out, spa, steam room and an exercise room. The floor plan is great for entertaining and the location is very convenient with shuttle bus access steps from the home. Now with 230 days on market, if the seller becomes motivated to come down to market value (approximately $365-$370 PSF, this could be a great buy. 360 Mammoth Knolls: Built in 1996, this beautiful home with great curb appeal in the Mammoth Knolls features 4 bedrooms, 2.5 baths, attached 2-car garage, 2,450 SF of living space, 8,276 SF lot and is listed for $1,150,000/$469 PSF. Floor to ceiling custom windows take full advantage of the forested setting, yet provide privacy at the same time without any other homes in view. You have the benefit of a peaceful and tranquil setting in the pines, yet only a short walk to the Village at Mammoth. This property has been on the market for 62 days with the current listing period and has been on and off the market over the past few years. The property last sold for $1,125,000 during the peak of the market in January 2005. At the right price/market value (approximately $945,000), this could be a fabulous vacation home for a buyer who wants to be in the Mammoth Knolls. 182 Canyon Blvd. : Built in 2006, this custom 4-bedroom, 4-bath home with attached 3-car garage, 3600 SF of living space, and 7,405 SF lot was recently reduced to $1,650,000/$458 PSF. Literally, almost across the street from the Village at Mammoth, this luxurious home features views of Mammoth Mountain from the large south-facing Jacuzzi deck, a family room, office, and the 3-car garage is large enough to accommodate an RV. This property is being sold turn-key and fully furnished. This is an unbeatable location for those who want to be next to the Village at Mammoth. 465 LeVerne Street: This custom luxury home in the Bluffs was built in 2002 and features 3800 SF of living space on a 14,810 SF lot with 4 bedrooms, 3 baths, attached 3-car garage and fabulous mountain views. Reduced from $2,600,000 down to $1,999,000/$526 PSF on February 7th, this shows a very motivated seller. This is a great price for a luxury home in the prestigious Bluffs neighborhood. Many custom features throughout include: Hand-hewn square log structural beams, a large great room with a floor to ceiling library wall, gourmet kitchen, hickory floors, media room and is being sold partially furnished. To request additional information on any active listings in Mammoth Lakes, June Lake or Crowley Lake & surrounding, feel free to contact me directly. It looks to me like all of these homes are really great quality! I have been wanting to find a nice, luxury home that I can go to for vacation. It would be great to find something as nice as these homes that you picture, because these all look great. Thank you for posting these, they will be really helpful when I start looking for homes!